Seismic shear waves passing through the Earth’s core travel at about half the speed of iron and related alloys at similar pressures, consistent with a “density deficit” in the core relative to iron or iron-nickel alloys. It is now widely accepted that, in addition to an iron-nickel alloy, Earth's inner core contains one or more lighter elements. The identity of these lighter elements, however, has been the subject of much debate for several decades. Among the candidate elements most likely to account for the density deficit are sulfur, carbon, silicon, oxygen or hydrogen. Alternatively, “softened” shear wave velocities at core pressures have been attributed to the presence of liquid, which calls into question the solid nature of the inner core. Using nuclear resonant inelastic scattering (NRIXS) spectroscopy to determine the phonon density of states of the model iron alloy Fe7C3, CDAC graduate student Bin Chen and co-workers from the University of Illinois, HPCAT, and the X-ray Science Division at the Advanced Photon Source (APS), were able to determine the shear wave velocities of the material at high pressures and extrapolate the results to the pressure of the inner core. 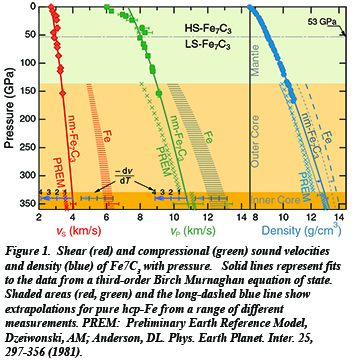 The measurements, carried out at Sector 3 of the APS, suggest that Fe7C3 provides a good match for the inner core, without the need to consider partial melting or large temperature effects (Fig. 1). Syncrotron Mossbauer Spectroscopy (Sector 3) and x-ray emission spectroscopy Sector 16, HPCAT) carried out on the same samples provided information on the nature of the magnetic and electronic spin transitions with pressure, confirming the low-spin character of Fe at the pressure of the inner core. The proposal the inner core has the composition Fe7C3 has dramatic implications for the amount of carbon stored within the Earth. Current models suggest that the Earth’s interior is depleted in carbon, but an inner core with the proposed composition would imply that up to two-thirds of Earth’s carbon is stored within the core [B. Chen et al., Proc. Nat. Acad. Sci, DOI: 0.1073/pnas.1411154111] .